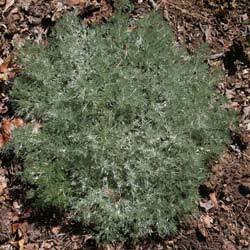 Grown for their silvery green foliage Artemisia make a great contrast plant in the garden. Easy care and fairly drought tolerant they work well in cottage gardens and can also be grown in containers. Artemisia are commonly called ‘Wormwood’ are from the astereacae family and fall into two categories, herbs and shrubs. As shrubs they are valued for the foliage, especially the silver forms. Artemisia schmidtiana ‘Silver Mound’ Nana is a low growing species suitable for use as a ground cover. Artemisia Foliage ranges from a pale grey to silver, a great accent plant. Varieties such as A. canescens, A. ludoviciana ‘Valerie Finnis’ and the well known Artemisia ‘Powis Castle’ are all worth a place in the garden. Cultivars such as A. Vulgaris ‘Oriental limelight’ with yellow variegated foliage make an excellent ground cover. Artemisia canescens grows to approx 15cm is a slowly spreading wormwood that has been revelling in recent dry conditions. Its low growth and non invasive habit make this plant an ideal candidate for the rock garden, edging or for the front of a well maintained border. All varieties prefer full sun and a well drained soil. Most require little fertiliser in good soils and can be pruned back in winter to spring. Artemisia or ‘wormwood’ are an attractive drought tolerant foliage plant ideal for the border. Prune back hard in early spring to maintain shape. Available for sale from the following nurseries.